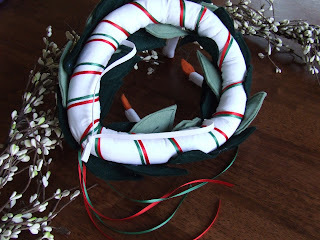 If you haven't seen Jennifer's amazing Santa Lucia crown, by all means, go check it out. I'll wait. Isn't it gorgeous? Many years ago, I ordered this set for Sunshine and her dolly from Magic Cabin. She didn't exactly have a dolly at the time and was probably too little to wear the crown, but I am glad I jumped the gun as I have never seen them offer one like it since. I know the privilege of being St. Lucy on St. Lucy's Day usually goes to the oldest daughter, but I just couldn't do that to Shortcake who decided this year, she would like to dress up too. So when I saw Jennifer's crown, I knew I had found the model of what I wanted to make for Shortcake. Rather than use a wooden form like I think Jennifer did, I melded the two ideas together and used a stuffed tube of white cotton muslin with ribbons circling around it. 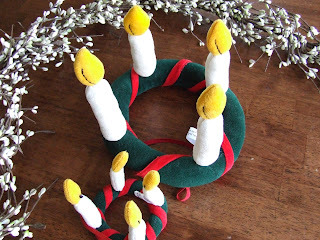 The candles are made by rolling up pieces of white felt and stitching them closed with a flame sewn on top. I wish I had used yellow felt, but oh well. Then I followed Jennifer's instructions for the leaves including the hot glue. The candles got sewn on just because I am that AR. I did contemplate sewing the leaves on but thankfully let myself off that hook (after getting about half way done). The berries are just little puff balls I had in my craft closet. Shortcake loves it and can't wait to wear it. Sunshine's might get retired after this year if I get enough felt to make another one. The matching one for her dolly is just made from some green floral print I had on hand and the flames are painted on. All in all it wasn't that hard. The girls helped me with the leaves and approved the design. They thought Lucy's crown was beautiful... oh, and her hair. Sorry girls. Maybe we can find some ear muffs that look like buns. Where is a Princess Leia costume when you need one? They turned out absolutely gorgeous, I love them!! Matilda! 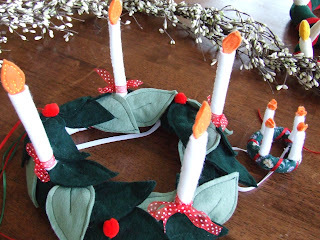 This is exactly what I'm in the process of...rolled up white felt for the candles and a soft-formed wreath, rather than wood. Primarily, because it is what I have on hand! Thanks for giving me my "visual"--we should be finished today! Those look so cute! I'm blushing at your compliments. Oh Matilda! Thank you so much for the link and for displaying your home version. I hate to admit that we've NEVER celebrated St. Lucy's feast day before. I ordered a cookie stamp for the day but never thought to make crowns. I'm off to the store RIGHT NOW to get supplies to make wreaths for my 4 GIRLS!! YIKES! I better get started! THANKS A MILLION for the head start!! Oh! It turned out SO beautiful! You did a wonderful job! I love it! Nice crowns! I hope to have something for my dd next year.